Three new officers joined the ranks of the Bossier City Police Department following a swearing in ceremony held this afternoon at police headquarters. Chief of Police Shane McWilliams administered oaths to Police Officers Felicia Anderson, Lorenza Levy Jr. and Cary Coller. Officer Coller joins the BCPD as certified law enforcement officer from another agency while Officers Anderson and Levy complete their training this week at the Bossier Sheriff’s North Louisiana Criminal Justice Academy. 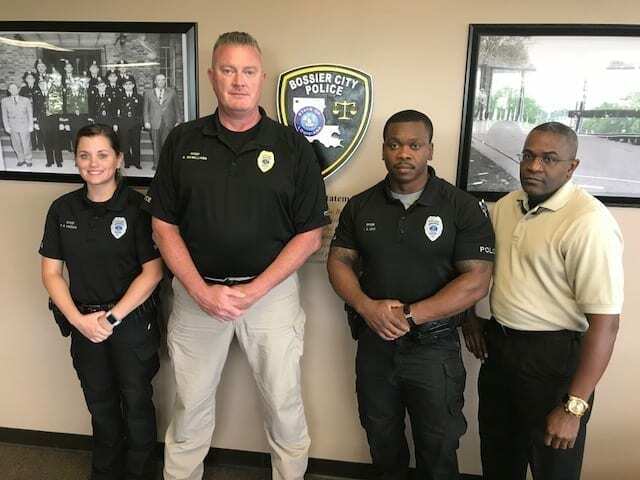 Next week the new officers will begin a 4-week long departmental training program to learn the policies and procedures of the Bossier City Police Department. Following their departmental training, the new officers will spend three months riding patrol with Field Training Officers before being assigned to the patrol division. Saundra Louise Coller Hi Mema!! This Friday, Scott Gill! Did they go to academy with you?